No matter where you go this season, you're bound to run into multiple pieces with embroidered details, especially bomber jackets and T-shirts. 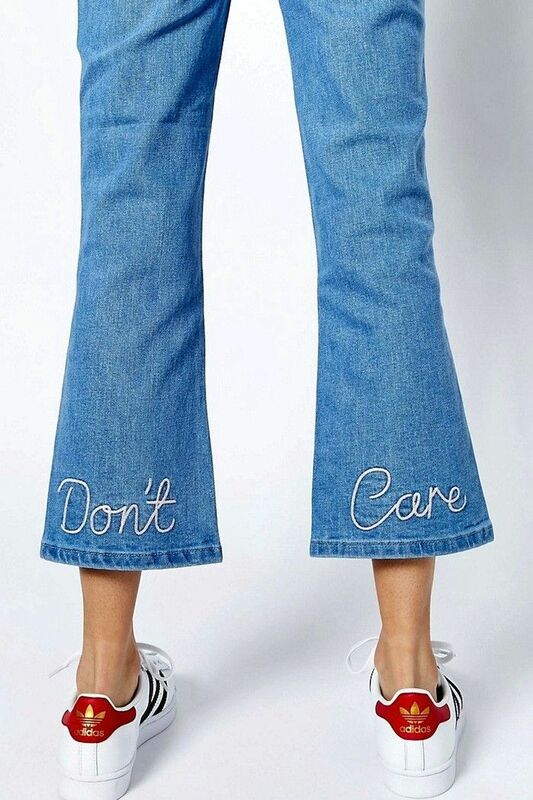 We were already obsessed with embroidered jeans, but recently discovered a pair with a cheeky message embroidered into the back of the legs that made us laugh: Don't care. Like with a tattoo, there is something fun about carrying around a message that is out of our own sight but on display for others to see, making this pair of jeans a guaranteed conversation starter. As for what to wear with them, the possibilities are endless. You can go sporty-casual with a black tee and Adidas sneakers, or take them out for a night on the town with an off-the-shoulder top and lace-up sandals. Did we mention they are budget-friendly at under $100? Yes, please! Scroll on to see why we are crushing on these jeans and to shop the look. These jeans will grab people's attention with the special message embroidered on the back. If you could have your jeans embroidered like this pair what would you have each hem say? Tell us in the comments below!